I’ve had Peter Pan Donut & Pastry Shop 727 Manhattan Avenue, Brooklyn, NY 11211 on my radar for a while and when I finally got there, I was surprised to see that it was a no frills, old-fashioned looking shop. For some reason, hearing about red velvet doughnuts made me think it was going to be some modern and fancy place, something like Doughnut Plant. Well, it’s nothing like that. The two are really not comparable, with very different flavors and styles. The good news is you can love both and I do. 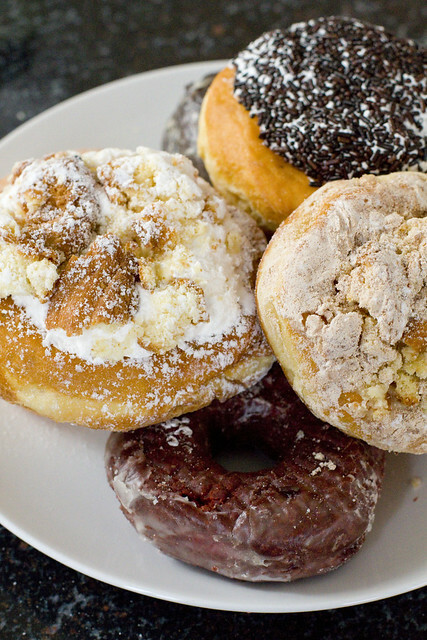 I’ll stick to Peter Pan on this post since I already wrote about Doughnut Plant. We tried six doughnuts and every one is big, fresh, with controlled sweetness. As usual, the cake doughnuts lose out to the yeast doughnuts, even the red velvet, which is cool, but Lon said no big deal. (I can’t eat those because of the food coloring.) 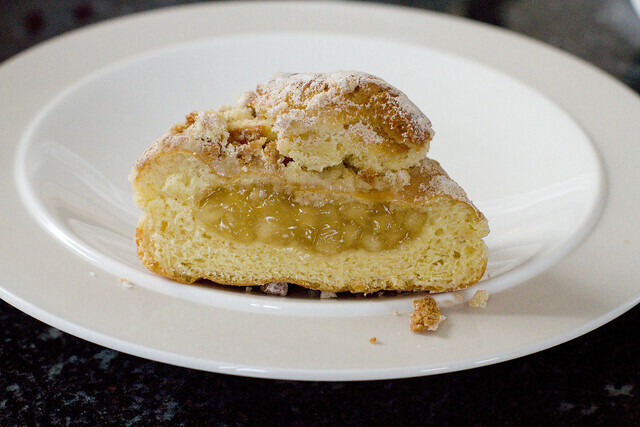 Our absolute favorite is the apple crumb. The apple pie filling has such a fresh apple flavor without being too sweet or too sticky and gooey. It’s generously filled and topped with what seems like chopped up coffee crumb cake. Lon’s other favorite was the doughnut topped with whipped cream and chocolate sprinkles. 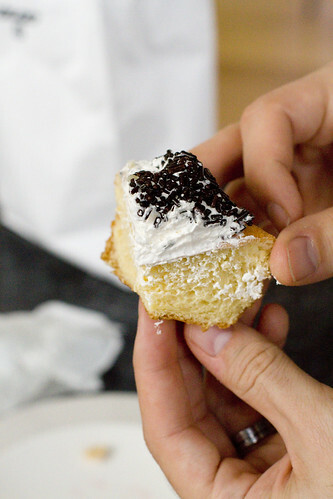 The feel is airy and creamy with that added texture from the sprinkles. I also enjoyed their clever idea of topping doughnuts with whipped cream and chopped cake doughnut, again gathering up multiple textures on a light base. 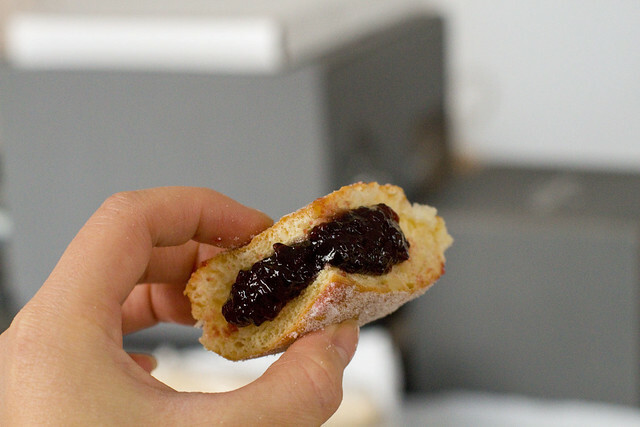 The sugar raised is ultra light and the jelly filled is very filled, which ends up making it sweeter than the others. What adds powdered sugar on top? The fact that these are very reasonably priced doughnuts, averaging out to about $1 each. It’s definitely worth a trip to Greenpoint, or several. posted by jessica	at 05:35 PM	Filed under Coffee, Tea, and Dessert, Favorites, Restaurants. You can follow any responses to this entry through the RSS 2.0 feed. Both comments and pings are currently closed. Oh.My.Gosh. I have been craving a donut for WEEKS. But haven’t indulged b/c I am scared I won’t be able to stop. Good night if this place was near me, yep, I would indulge, especially in the cake ones. I know, not everyone’s favorite, but I LOVE cake donuts. Although, that apple crumb, holy smokes, YUM!!!! They make the best ham/bacon egg n cheese I’ve ever had! Jamiel, good to know. We can have a whole meal there. I saw shakes on the menu too. Anyone had? happycao, I’ll make sure to get one of those when warm weather roles around again! Make sure you guys try the sour cream. Super good! If you want to feel like you’re eating something healthy the whole wheat is pretty awesome too. looks great and the prices are great! but i’d hardly call doughnut plant ‘fancy’. Noel, they didn’t have either when we were there but will keep a look out next time. And, there will definitely be a next time. KBow, I meant more the doughnuts being fancy, not necessarily the space. Wow, these are mouthwatering! Where can I find the recipes?? HI Laurel, this is a review of a shop so we don’t have their recipes. The Cinnamon Buns (glazed or not) are also incredible. They’re as big as your face and will last you all day. Un-peel the outer layer, gradually, until you get to the sweet, sticky center. Perfection. I actually posted about Peter Pan yesterday, as a local Soda Fountain/Cafe in my neighborhood is selling their donuts on Saturdays! Very exciting!